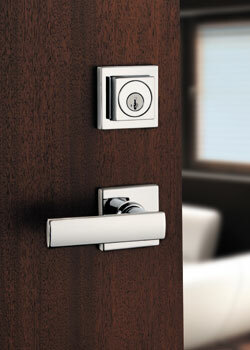 Collections by Weiser™ offers many distinctive door handles, one of them being Vedani (Square). Some levers are "handed", which means you need to consider which way your door swings for the lever to curve up or down in the correct direction. Weiser levers are fully reversible so they're easy to install and give you one less thing to worry about. The bold form and clean geometric shape of the Vedani lever reflect a contemporary aesthetic. It has a Grade 2 certification by ANSI/BHMA (American National Standards Institute/Builders Hardware Manufacturers Association). The Vedani lever also features Weiser SmartKey® re-key technology. This allows you to re-key the lock yourself in seconds (depending on the function). Looking for the round Vedani lever? Go to this page.